Edmonton’s vision as a Candidate Host City is the use football to unite the community, province, country, and world. The city will build excitement through community, motivate activity through growing awareness, inspire dreamers, and find unity in diversity through a shared passion for the game. At just over 125 years old, Edmonton is one of the youngest and fastest-growing cities in Canada – already the 5th largest city with a GDP, population, and income growth three times the rate of the rest of the country. It is one of the most diverse metropolitan areas in Canada, with energy, construction, government services, and entrepreneurship forming the backbone of the city’s resilient economy. Football has a rich and proud history in the city of Edmonton and province of Alberta. The city has welcomed football fans into the province and Commonwealth Stadium for many international matches and tournaments, twice setting the record for the largest crowd to attend a Canadian National Team event in Canada: the 51,936 that watched Canada Soccer’s Men’s National Team draw the soon-to-be-crowned world champion Brazil in 1994; and the 53,058 that watched Christine Sinclair score the penalty winner in the final moments of the FIFA Women’s World Cup Canada 2015™ Opening Match. Over the years, Edmonton has hosted the 1996 CONCACAF Men’s Olympic Qualifying Tournament, the FIFA U-19 Women’s World Championship Canada 2002, the FIFA U-20 World Cup Canada 2007™, the FIFA U-20 Women’s World Cup Canada 2014™, and the record-setting FIFA Women’s World Cup Canada 2015™. 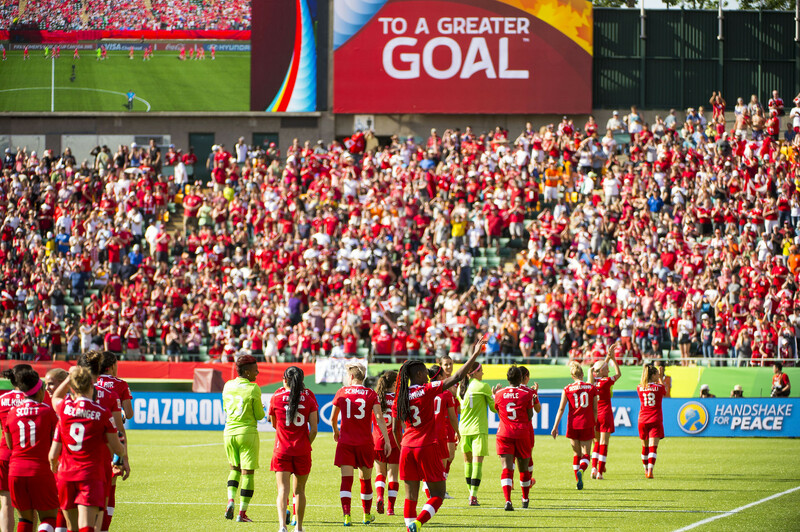 From 1993 to 2008, Edmonton hosted the largest Canadian football crowd of the year eight times, including the 2001 IAAF World Athletics Chamionship, and a still-standing record of 47,784 fans for the FIFA U-19 Women’s World Championship Canada 2002 Final. Since 2011, the city’s top franchise has been FC Edmonton, with both a men’s professional club and boys’ and girls’ youth academy. Edmonton is also home to the Oilers (hockey) and the Eskimos (football). The city also features the Tour of Alberta cycling race, the FC Edmonton residency program, and Canada Soccer’s Alberta Regional EXCEL Super Centre for young women footballers.